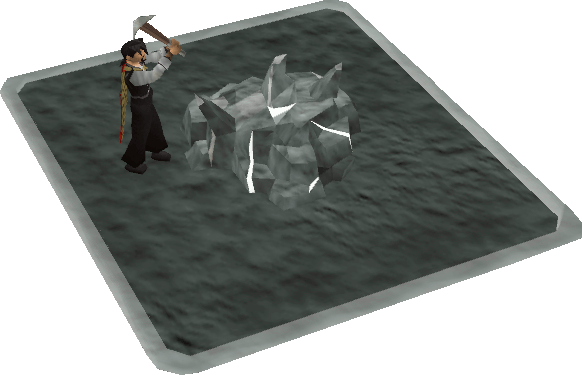 Stealing Creation is an Activity set in the Wilderness. The aim of the game is either to collect clay and process it into weapons or tools (for collecting more clay), collecting clay and then depositing it into your base, or killing the other teams members to prevent them from collecting the clay. 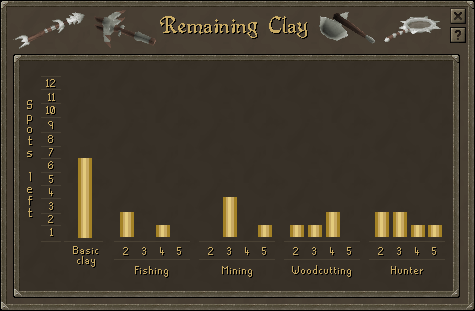 Collecting, processing and depositing clay, as well as combat, earns you points. The amount of points you get in the game effects the amount of reward points you get at the end. See Rewards for more information. Note: You can not take any of your own items into the Activity, but items obtained during the game will be lost. 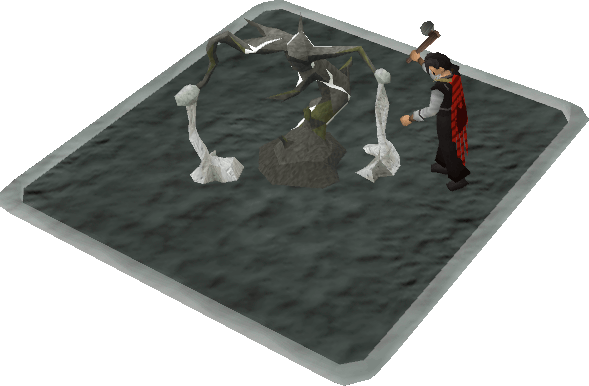 The set worlds for Stealing Creation are World 158 and World 164. 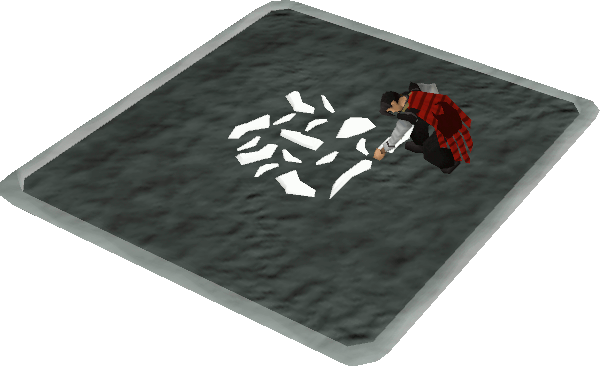 Stealing Creation can be found in the Gamer's Grotto located just north of Falador, and there are three main methods of getting there. You can use a Games Necklace to teleport to the Gamer's Grotto. From there, enter the portal to the Stealing Creation arena. The Gamer's Grotto is located just north of Falador. Simply walk there along the road north of the city. 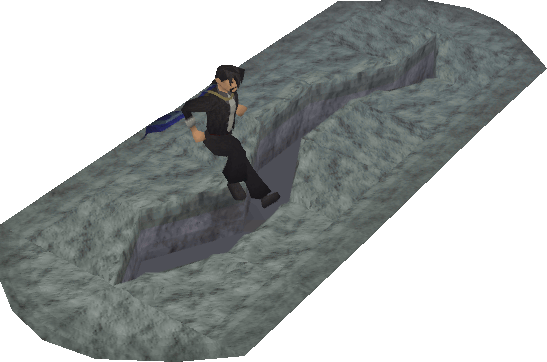 There is also an Agility shortcut on the northern wall of the city which requires use of a Mith Grapple to climb over. This shortcut will bring you outside the Gamers' Grotto. 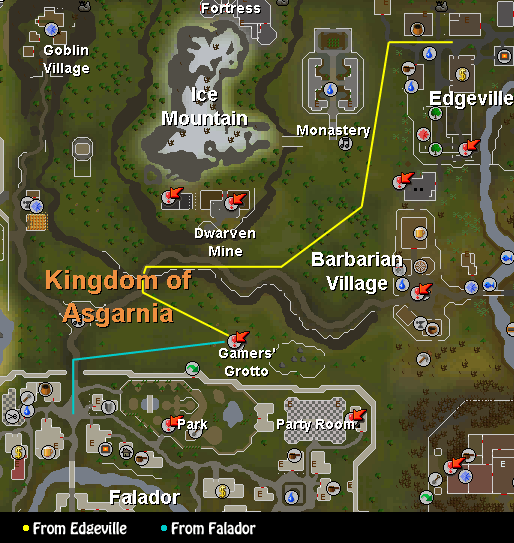 Leave Edgeville heading southwest until you reach the road between Barbarian Village and Falador. Travel west along the road, now the stairs, and then southeast until you reach the Gamer's Grotto. 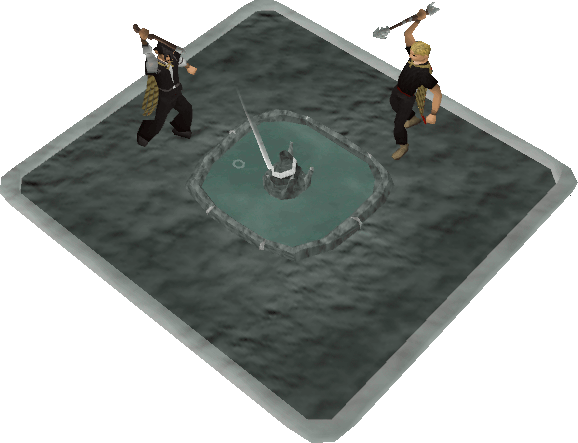 Note: If you're ever wanting to get back to a bank, a Mystic on the west fence will hit you with a club that teleports you back to your respawn point. He will also heal you if you ask. There is also a Bank Deposit Box in the Clan Games area with a "Deposit All" feature to quickly bank any items you have. The more players you have in the team, the higher those totals will become. Once both teams have at least five players each, a countdown from two minutes will start. 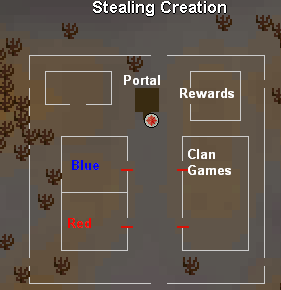 Once those two minutes are up, everyone in those teams will appear in their base in a Stealing Creation arena. Gathering clay shards requires no skills or levels. Note: You don't need tools to collect clay from areas, however it is faster if you use them. The higher the class of the clay, the better the item that you make. 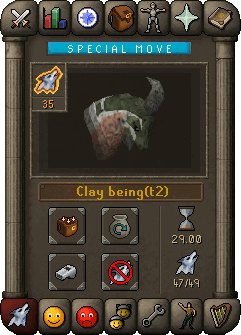 In case of runes, the higher the class of the clay, the more runes you get per clay. When processing clay in the Kiln, you are safe from any attacks. However, if someone is attacking you as you run to use the Kiln, you will be automatically stopped from using it. Note: You need particular levels to process clay. Like collecting it, you need the same levels for processing that type. (For example; Class 4 clay requires level 60+). You can either use the clay you processed to help you get more, you can use it to help fight your opponents or you can deposit it, getting you even more points. 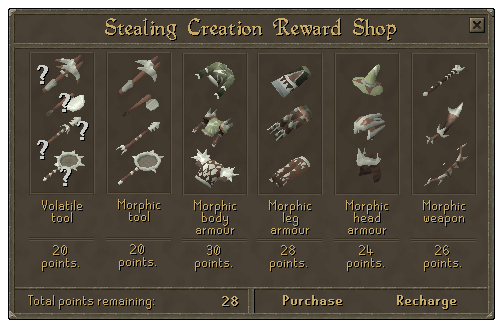 Thieving is a great help in Stealing Creation. If your Thieving level is 20 levels higher than that of your opponent, you can pickpocket him or her. The higher your opponent's Thieving level, the harder it is to pickpocket them successfully. Thieving is especially a great help when you have opponents using Magic to fight you; you can pickpocket their runes if you're lucky. You can also pickpocket people gathering clay, therefore effectively stealing the clay they've been collecting. 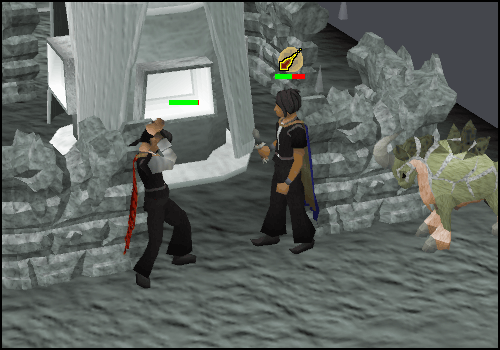 Combat plays a big part in Stealing Creation. A team with a lot of high leveled players often have an advantage if they use combat. Killing the opposition will make it hard for them to collect clay, therefore giving you an advantage. If you've done Desert Treasure, using Ancient Magicks is a huge advantage, as it can freeze people, slowing them down and making your kill easier. 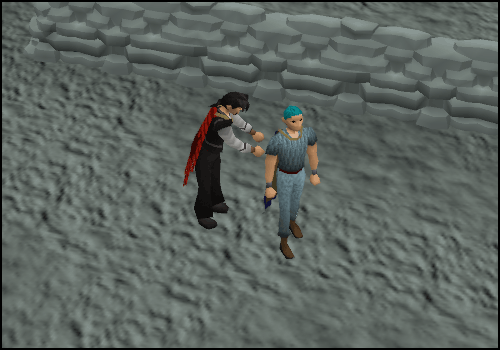 A dagger is probably the most used melee weapon in Stealing Creation as it is the fastest to attack. Ranged is also a great help when trying to kill people from a distance. There are certain shrouds within Stealing Creation called Fog Banks. If you run into these, people can't see or attack you while you're in them. It's useful when being attacked to run through them as you get away, as the players will automatically stop attacking you and you'll have a better chance of surviving. While exploring the arena, you may come across a Rift. These obstacles require an Agility level of 40 to jump over, and can be useful in putting some distance between you and an attacker. You may also discover Walls in the arena. Similar to Rifts, these obstacles can be jumped over by players with level 60 Agility. 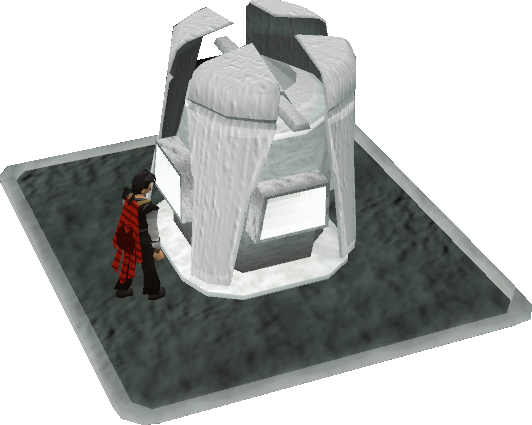 There are also altars in the Stealing Creation arena. These altars restore your Prayer, Energy and Summoning Points. 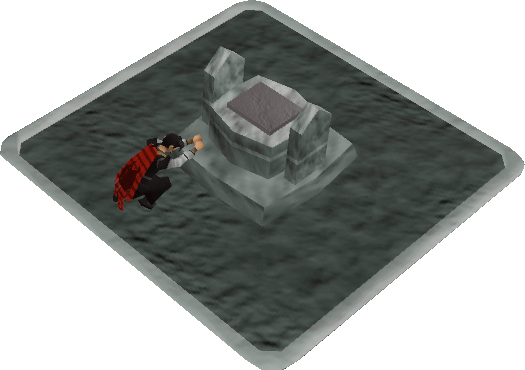 However, since the layout of the Stealing Creation arena is always random, it's possible for an arrangement to not include any altars. 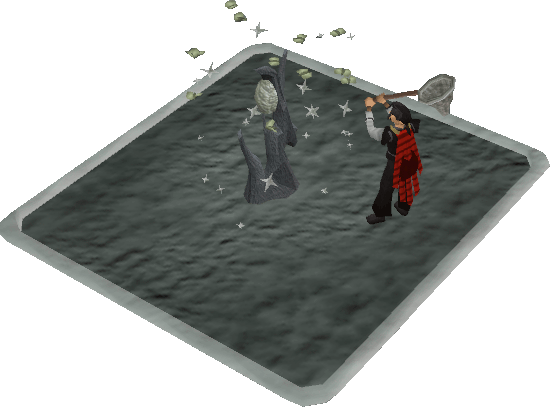 There are several tactics that are successfully used in Stealing Creation. Whether your plan is to hide away and score points, or to fight behind enemy lines in the hope of preventing them from depositing clay, simply collecting and depositing clay through the entire game will score you big points. Firstly, you're going to need a decent team. Try and go for the team with the most high leveled players. This will make it easier if the opposition uses combat a lot. When you enter the game, try and explore the arena. This way you'll get the lay of the land, and you'll know where good spots to collect and process clay are. Next, you'll need some tools. Try and get the highest class tool as possible, since collecting clay will be faster. Now go to a spot which is reasonably secluded, located fairly close to a Kiln, and has a good spot for you to collect clay from. Summoning a familiar is best, as you can use them to store items. All you need to do now is to repeatedly collect and process the clay. 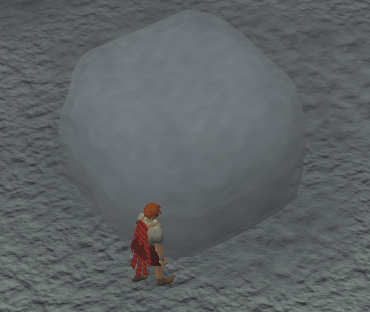 Processing your clay into runes and arrows is best; they're probably the most used combat item in Stealing Creation. Runes and arrows will come in great use to anybody who needs them. They're best to store in your familiar, since otherwise people can come along and pickpocket you, thus leaving you empty handed after all your hard work! Arrows can be stored in your equipment spot, but it's best to store them in your familiar, since if you're attacked, you can use the special ability scroll to deposit your items to your base. Having you do all this can score around 60,000-120,000 points per game, depending what the conditions of the match are. Doing all of this can be pretty difficult, especially if the other team is heavily based on combat. Making barriers to stop the opposition attacking you is very useful; however do not make them unless you need to, as having them there will just slow you down. Combat is pretty useful, but don't expect to be scoring any big points from it. Using Ancient Magicks is pretty useful. Using ice spells, you can freeze the opponent and stop them from getting away. If you are fighting, aim for the people who are using combat as well. If they've been killed, or if none of them are around, aim for the players that look like they're going to be scoring big points (i.e. players who are repeatedly running back and forth between Kiln and a collecting area). They're most probably collecting and processing clay ready to store in their base. Make sure you have a lot of food and potions though, as you're going to be doing a lot of fighting. If you're ever running low, and there's nobody around attacking you, it's easy to pickpocket some of the players who are collecting clay. You can use their clay to make more food, thus keeping you alive longer. However, if you're hanging around directly outside the opposition's base, expect people you kill to keep coming out and attacking you more in an attempt to kill you. There are two types of tools: Volatile Tools and Morphic Tools. The Volatile Tools last longer than the Proto Tools, but you cannot choose what it will transform into. Morphic Tools don't last as long, but you have the choice of what you want to transform it into. The armor you buy from the rewards shop will also give you double experience in the combat skill you are training, and so will the weapons. However, the melee armor is only as good as rune armor, the ranged armor is only as good as green d'hide (except for the coif, which is equivalent to a regular coif) and the mage armor is only as good as Mystic Robes. Note: All the rewards will only last for a certain time before they run out of charges. When the armors will run out of charges, they can no longer be transformed into other armors, and they will stop giving double experience. Tools will disappear as soon as they run out of charges.